Today I felt like a contestant in that popular show from the Food Network – Chopped. I had some left-over ingredients which needed to be used up but they seemed to be an odd assortment. Initially, I felt like it would be weird to merge them in one dish, much like in Chopped (though perhaps not as extreme) where contestants are supposed to come with a yummy dish using a medley of ingredients which you don’t normally put together. That was my challenge for the day – how to use in one dish a few pieces of sun-dried tomatoes, a little wine, two types of cheeses and ground beef. In a large bowl combine the ground beef, ricotta cheese, parmesan cheese, egg, sun-dried tomatoes, garlic powder and salt and pepper. Use your hands to mix everything well. Shape the mixture into balls the size of golf balls (about 16 pieces). 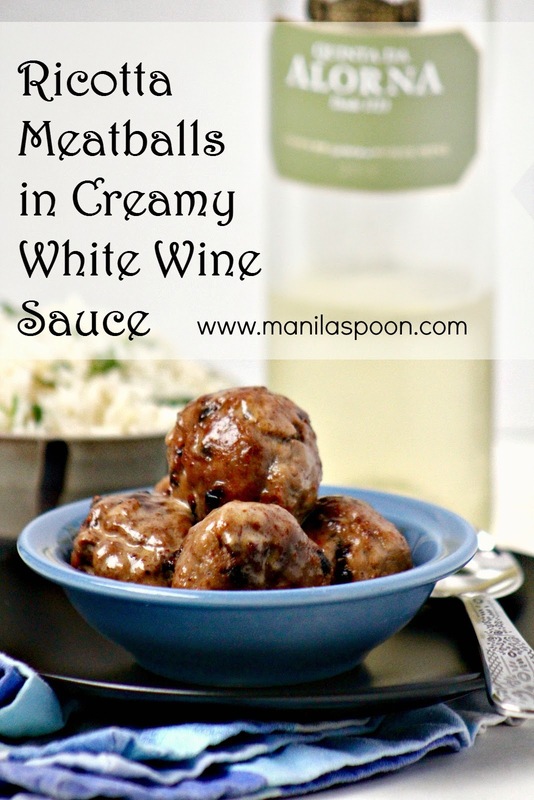 Gently roll the meatballs in flour to coat them lightly; shake-off the excess. Melt the butter in oil in a large and heavy-bottomed skillet or pan using low-to-medium heat. Saute the garlic for about 1-2 minutes. Remove the garlic cloves when they turn brown. Fry the meatballs just until they are browned all over. Pour in the wine, increase the heat a little and let it reduce to about half. Add the cream and let simmer until the sauce has thickened. Adjust the seasoning, if necessary. Serve immediately. We had it with rice and some steamed veggies on the side. But it would be yummy with a piece of bread, too – handy to mop up the sauce or serve it over pasta. Enjoy! These meatballs look so good. What a great recipe! Ricotta makes meatballs so tender and juicy. Love the sauce in your recipe. Perfect way to use those leftovers!